You may have seen local artist Steve Bretel out and about at a few shows recently – he’s been helping out at AdventureArt on the few days he can escape from his studio. He’s just launched a new website for his Pet Portrait business – Animal Visual. Steve works with all sorts of animals from domestic to farm and wildife, but specialises in Dog Portraits and Equestrian Portraits. 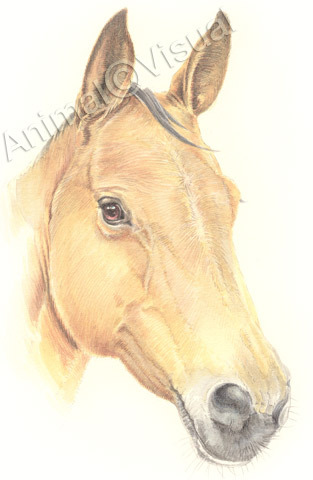 The painting above was made as a Chrismas present for my wife from some photos I’d taken of Teaser, our Dutch warmblood. This entry was posted on Thursday, April 19th, 2012 at 1:20 pm	and is filed under Uncategorized. You can follow any responses to this entry through the RSS 2.0 feed. You can leave a response, or trackback from your own site.